Fifth grade promotion ceremonies are happening all over the district this week as the school year draws to a close, but the ones at King and Moulton are especially farsighted, looking beyond the transition to middle school all the way to college. Those schools are partners with Iowa State University in the ISU4U Promise, a pact that guarantees tuition defrayal to students who go on to DMPS secondary schools and qualify for admission to Iowa State upon graduation from a district high school. The discounted tuition accrues @ 20% per year of attendance at Moulton or King. Students who log at least five years at either can max out at 100% free tuition. No wonder there was a strong ISU accent to the 5th graders’ big day at Moulton Thursday morning. Principal Eddie McCulley addressed the 74 Tiger “seniors” and described them in terms of an acronym that was looping on the carousel of the digital sign outside the school entrance: GRIT. In the past, many would have labeled these kids underprivileged. Their neighborhoods and circumstances are generally tough ones. But an opportunity like ISU4U Promise is a spectacular example of how schools can serve as tunnels for escape from hardship. Shari Miller from the ISU School of Education was on hand and she followed McCulley’s remarks with some reminders for the proud families packed into the auditorium about how to enroll in ISU4U and how it works. 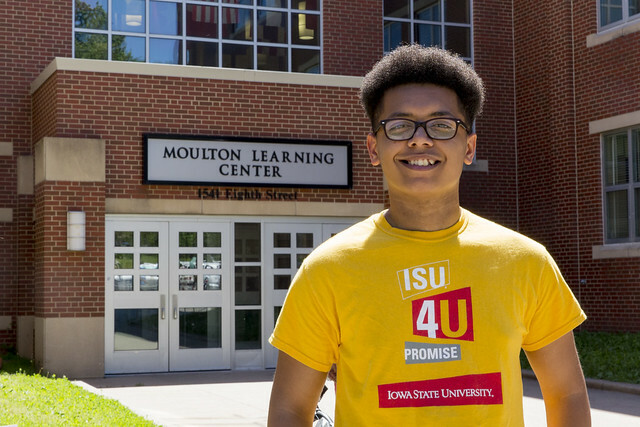 There was a video that spotlighted three Moulton alums who are heading to ISU in the fall, tuition-free, as part of the first batch of DMPS grads to hold Iowa State to its generous promise. It’s finally, actually happening. What sounded too good to be true when first announced turns out to be for real. The final proof was Darrick Burrage, a newly minted graduate of North High, Class of 2018. Burrage too was a Tiger before he was a Polar Bear. Next fall he’ll be a Cyclone and begin pursuit of a Performing Arts degree with the university picking up the tab for his classes. Burrage told the crowd that he didn’t realize what the ISU4U Promise might mean to him when he was still at Moulton. One by one, they marched across the stage to collect their certificates and an ISU4U backpack, hints and samples of bigger things to come.